Form : Ryô-shinogi-zukuri. High shinogi. Hira-niku attached. Moto and saki a little wide, becoming narrower in the middle. Nakago : Ubu. Saki is kuri-jiri. Yasurimes are kiri. One hole. Jigane : Itame-hada well grained. In nagare-gokoro state, masa mixed. Jinie attached. Chikei appeared. Habuchi getting loosed. Yubashiri appeared. Sunagashi appeared. Hamon : In suguha-tone. Shallow notare attached. Habuchi getting loosed. Yubashiri appeared. Sunagashi appeared. Boushi : It runs in sugu. It shows yakitsume state. Saki is hakikake. Swordsmith Aritoshi had secular name EZUMI Shôhei. He was born in Shôwa 4(1929). He created the swords at Kashiwagi town, Nara city. He tried to study aspect of old ken "剣" swords. He created many ken "剣" swords. [ Highlight ] In Nara, where Yamato imperial court exist in ancient times, there have been many major Buddhist temples, such as Tô-dai-ji temple, or Kôfukuji temple. It may be able to consider that many ken "剣" swords created for religious purposes, such as Buddism, from old times. 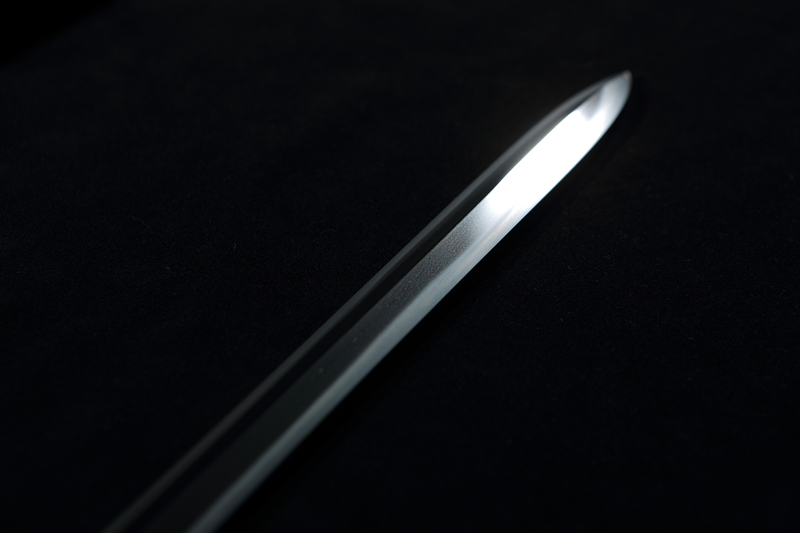 This sword has longer nakago finish. Below half has tight shape. Moto and saki have wider width. Those feature correspond with ancient ken "剣" sword. Dignified and elegance ken "剣" sword, which has honored as doryoku-shô award in shin-saku-tô tenrankai exhibition in Heise 8(1997). [ Conditions ] Excellent except a few scratches. 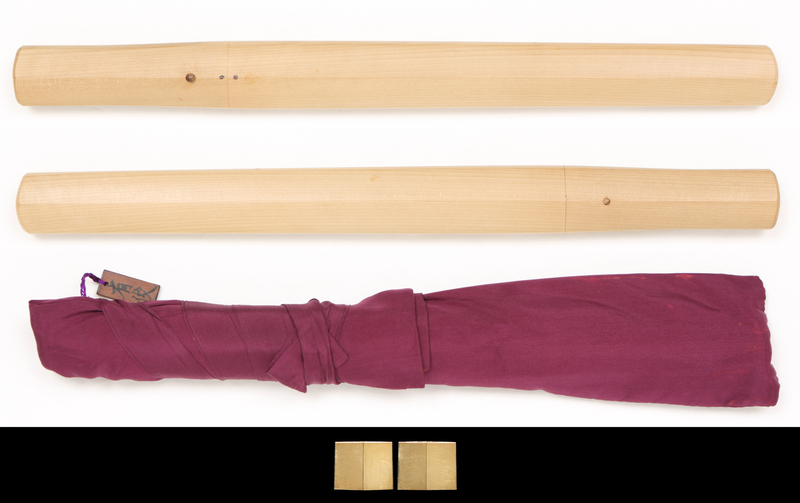 [ Attachments ] Habaki (gold, single), shirasaya and bag of shirasaya.